Following a condition survey in 2010 the Environment Agency decided to rebuild Molesey Weir, which is located immediately south of Ash Island on the River Thames. The project involved the complete reconstruction of the existing structure with new foundations, apron, stilling basin and gate supports. A new timber shingled canopy, supported on a steel frame, has replaced the old one and the existing fish trap was replaced with a new Larinier fish pass. 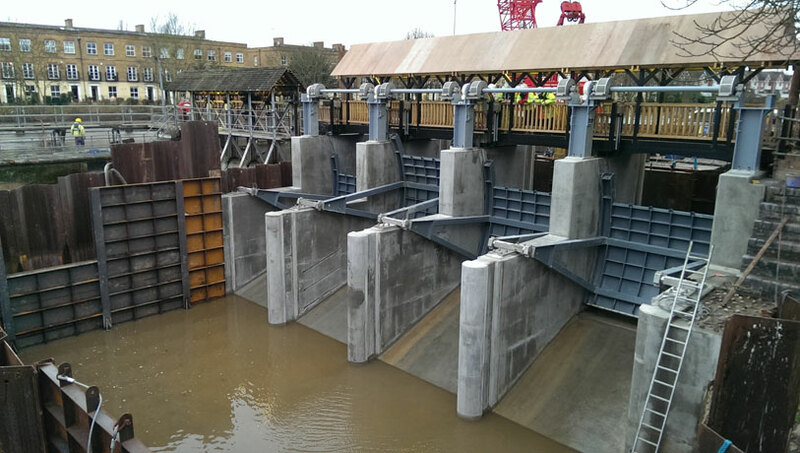 The project included the design, supply, delivery to site, offloading, installation and commissioning of the weir. The works were undertaken over two consecutive summers during the low flows on the river. The scheme offered an ideal opportunity to study the impact of our piling operations on several fish species in the Thames. Our staff tested the frequency of pilings as part of the research, while underwater vibration levels were taken and cross referenced with known thresholds affecting fish behaviour. The results of this study can be directly applied to the control of high vibration construction activities, helping the recovery of flagship fish populations in the Thames. Weir B is in close proximity to Ash Island and the project team engaged regularly with the residents to minimise the impact of the construction works. Echo barriers were installed on Ash Island to screen the noise from the piling operation and noise and vibration monitoring was carried out throughout the works.